0 TO 60 IN UNDER 3.5 SECONDS. Get instantaneous power the moment you twist the throttle. No clutch to release. No gears to run through. All you do is flick your wrist and take off. ESTIMATED 110 MILE RANGE* The LiveWire™ motorcycle features a high voltage battery that produces incredible acceleration. It means plenty of range and torque on tap for unlocking the city. TWO EASY WAYS TO CHARGE. Use the onboard Level 1 charger and power cord to connect to any standard household outlet and get a full charge overnight. For a faster charge, visit any public Level 3 DC Fast Charge station. H-D™ CONNECT SERVICE**. Meet the world’s most connected motorcycle experience. With cellular telematics connectivity powered by Panasonic®, you can connect remotely through your smart phone using the latest version of the Harley-Davidson™ App. Check bike vitals like battery charge status, see its location on a map, and get security alerts if it’s been bumped, tampered with or moved. From the muscular shape of the motor to its aggressive stance, LiveWire™ delivers the iconic look you expect from a Harley-Davidson® motorcycle. 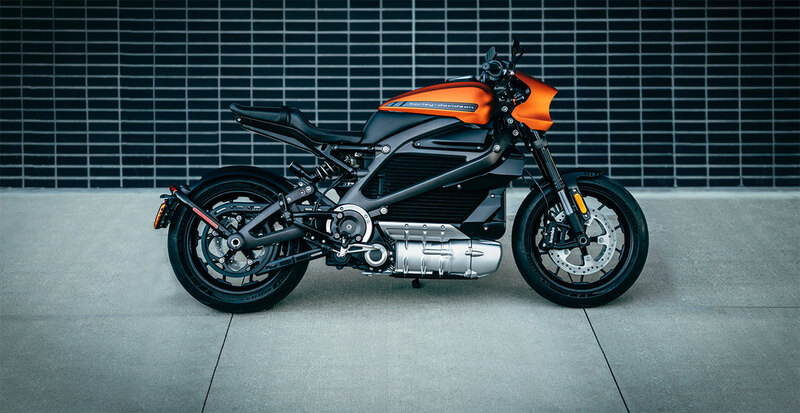 H-D Revelation™ Powertrain: The permanent magnet electric motor can produce 100 percent of its rated torque instantly – it’s the reason for Livewire’s incredible acceleration. It’s located below the battery to lower the center of gravity for easier handling. H-D® Michelin® Scorcher® Sport Tires: The LiveWire™ motorcycle rides on premium 180mm rear and 120mm front H-D®/Michelin® Scorcher® Sport Tires. They were designed exclusively to enhance the ride and handling performance of this ground-breaking machine. Customize Your LiveWire™: Coming Soon! Genuine Motor Parts & Accessories to make your LiveWire stand out on the road. You’ll be able to customize your bike with accessories like a speed screen blade, hand and foot controls and more. The LiveWire™ motorcycle to be available in select dealerships in the Fall of 2019. It is a technology that provides cellular connectivity that can link a LiveWire™ owner with their motorcycle through their smart phone using the latest version of the Harley-Davidson™ App. H-D™ Connect allows owners to connect remotely to their LiveWire™ motorcycle and allows for viewing of key vehicle health information such as battery charge status. It will also send you security alerts if your bike has been bumped, tampered with or moved. GPS-enabled stolen vehicle tracking provides peace of mind. H-D™ Connect also tells you the location of your parked motorcycle on a map, sends you automated reminders about upcoming vehicle service and a charge station locator. Will the LiveWire™ motorcycle retain all functionality if I don’t care to subscribe to H-D™ Connect? Cellular service is required for the H-D™ Connect Service related capabilities to function. Generally, H-D™ Connect will continue to function in areas with lower cellular service quality coverage such as 3G areas.